Members of IAM Local 701 have been on strike in their fight to obtain a first contract at the Napleton Cadillac car dealership in Libertyville, IL, for more than ten months, including during the Chicago winter months. A labor rally has been planned for Monday, June 25th in support of a group of IAM Local 701 auto mechanics on strike at a Chicago-area car dealership for more than 10 months. The striking members are back on the strike line in their fight to obtain a first contract at Napleton Cadillac of Libertyville in Libertyville, IL. This after the line had been pulled down for nearly eight weeks after the union gave an unconditional offer to return to work after receiving a favorable decision from the National Labor Relations Board (NLRB). IAM Local 701 filed multiple unfair labor charges against the dealership in 2017. 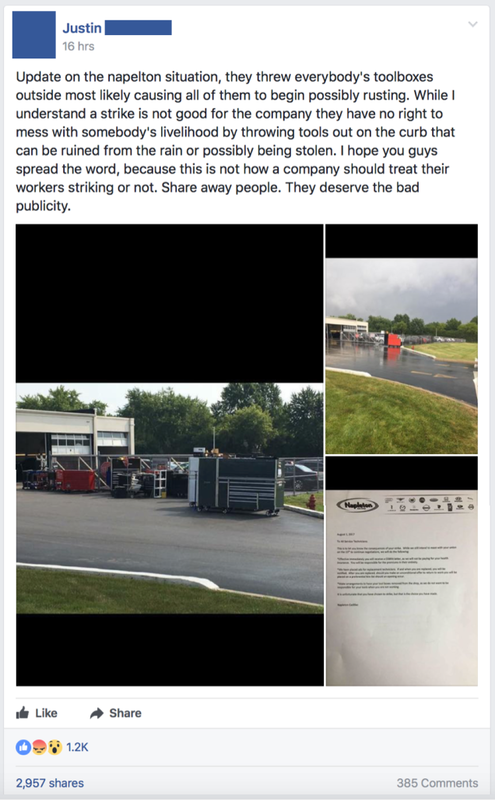 Charges included management’s attempts to intimidate the workers by sending threatening letters, rolling out mechanics’ toolboxes and leaving one worker’s $100,000 worth of tools out in the rain damaging his electronic tools and toolbox. Videos and photos of the incident went viral on social media. An Administrative Law Judge recently found merit on the charges indicating there were several “unfair labor practice charges committed.” The union has filed additional charges for reneging on an already agreed upon agreement as well as the employer’s refusal to bring our members back to work after giving our unconditional offer to return to work. The labor rally will be held on Monday, June 25th from 9 a.m. to 2 p.m. at the Napleton Cadillac of Libertyville car dealership in Libertyville, IL.